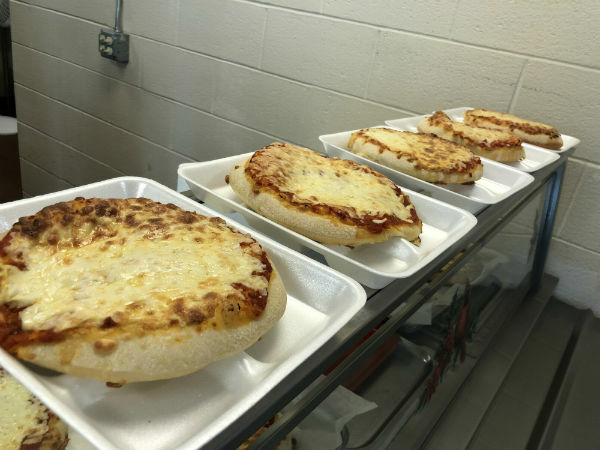 On the 8th of December, Woodland’s cafeteria introduced a new and exciting dish: personal pizzas made from scratch. The Food Service Director, Patricia Iraci, had the idea to serve personal pizzas to the students after seeing how pizza sales were going down. She thought of implementing a larger portion to help satisfy the students in order to help raise sales. In the past year, Iraci changed Region 16’s pizza recipe to now include fresh dough, sauce and cheese. The dough they use is Rich’s Proof and Bake. It comes frozen and is left overnight in the fridge to rise. In the morning, it is pulled out and placed in a proofer, which is a warmer with water on the bottom to add moisture to the air. After the dough has doubled in size, sauce is added along with mozzarella and grated parmesan. They are baked for fifteen minutes in five inch individual pizza pans and are then served to the students. Pizza sales went up 38% and several students asked if they could possibly bring them back in the future. Iraci shared that she is hoping to replace the current pizza station with a personal pizza station, and plans to have the personals on the menu every day of the week. That day, the station accounted for 43.3% of all food sales. Almost half of all student purchases came from the lovely five inch wonders. In fact, the pizzas were such a big hit, Iraci has placed them on the menu three times for January. Iraci was not a fan of the processed pre-made pizzas that were being sold, as she wants to try and get the kids out of the habit of eating processed foods. Processed foods are any foods that have been altered in some way during preparation. Food processing can be as basic as freezing or canning. These foods are often high in unhealthy fats. Usually, processing contain cheap fats, refined seed, and vegetable oils, such as soybean oil that are often combined with hydrogen, which turns them into trans fats. Vegetable oils are extremely unhealthy and the students are eating way too much of them already. The student body definitely saw the change in the pizza recipe, along with all the bread changes. All of the bread products are now made fresh at school, including the deli line, dinner rolls, and now, the pizzas. Deli sales went up about 20% apon the arrival of the fresh baked bread. Heat and serve is the terminology used to describe heating up frozen food and dishing it out. Almost half of all frozen foods are processed, and the more the students are exposed to these bad elements, the more likely it’ll be that they start to adapt that way of eating into their real lives. According to Iraci, almost 60% of our average daily calories come from frozen and processed foods. “I want to help these kids get on the path of healthy eating. The longer they continue to eat unhealthily, the longer and harder it will be for them to get back on the right track. If me making them fresh personal pizzas can help with that, I’ll serve them every day,” Iraci proclaimed. While the personal pizzas were a huge hit, a lot of effort was put into them. They will not be served very often, but Iraci will continue to push until they can be a daily option along with the chicken station.